In the winter, the temperature drops and the days get shorter. That means less light around your building’s perimeter. Wherever your building is located, criminals will see a darkened area around the perimeter and pounce. Securing your building’s perimeter in the winter is especially important because it makes the area less inviting to hooligans. 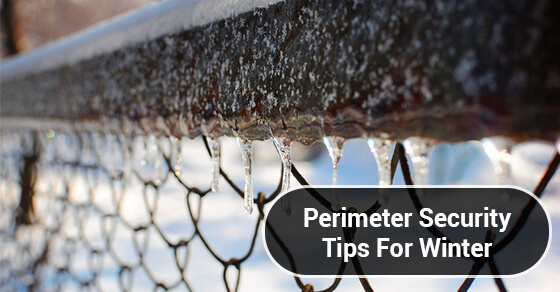 If you’re unsure on how to secure your building’s perimeter in the winter, try the following tips. One of the easiest deterrents to keep criminals away is a sign or decal from a reputable alarm company. Many criminals see that a building is protected by a state-of-the-art alarm system and don’t even bother to breach the perimeter. Signs that indicate that there are dogs guarding the premises are also effective. Place these signs and decals where they will be the most visible like on a front door, warehouse loading dock, storefront, or fence. Oftentimes, building perimeters are shrouded by trees and other landscaping. Trim trees and shrubs so that no one can hide behind them, and remove any blind spots. Another great way to increase the visibility of your building’s perimeter is to install wall-mounted or freestanding light 12-14 ft. above the ground. These can be placed on the corner of the building, under or above windows, or basically anywhere that will illuminate anyone who isn’t supposed to be there. Most criminals will flee as soon as a light is shined on them. You should have these lights correspond to motion sensors to allow for maximum security. Using CCTV to secure your building’s perimeter is beneficial in more ways than one. First, you get the added security of knowing that your building is being monitored at all times. Second, if someone is lurking around your building and looking suspicious, you can see them on camera. Third, CCTV can record the footage so if someone does break in, you can share the footage with the police. Perimeter fencing can create an added layer of security for your building. Fencing can protect meters, HVAC equipment, transformers and other mechanical devices found around your building. You should also consider fencing around the parking lot and loading dock of your building. The best type of perimeter fencing is chain link because you can secure it with heavy duty padlocks and place ragged wires at the top to deter criminals from trying to climb it. Criminals do not take time off during the winter and neither should your security system. If you do not employ an intrusion security alarm system for your building or commercial space, you risk being the target of burglars and vandals. Contact Fire Monitoring Of Canada Inc. for more information about our perimeter security options.